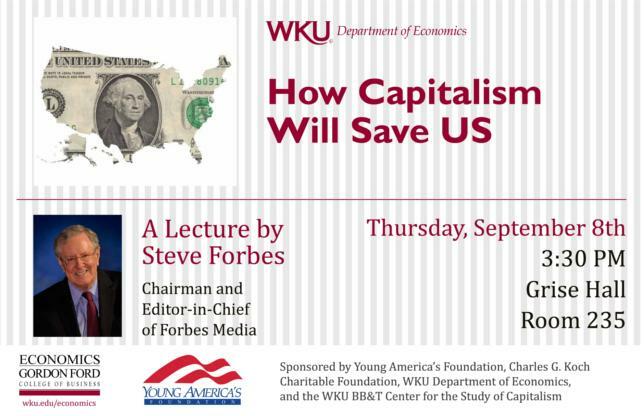 The WKU BB&T Center for the Study of Capitalism will host a lecture by Steve Forbes, Chairman and Editor-in-Chief of Forbes Media, on Thursday, Sept. 8. Forbes’ presentation, “How Capitalism Will Save Us,” will begin at 3:30 p.m. in Grise Hall Auditorium (Room 235) and is open to the public. Dr. Brian Strow, professor of Economics and director of the WKU BB&T Center for the Study of Capitalism, said Forbes will argue that capitalism, as an economic system, is uniquely equipped to improve the quality of life of citizens who live in countries that adopt it. His talk will last approximately 45 minutes, followed by questions from the audience. The lecture is sponsored by Young America’s Foundation, Charles G. Koch Charitable Foundation, WKU Department of Economics and the WKU BB&T Center for the Study of Capitalism.